"I am very critical of what I photograph and how it appears. The majority of my photographs never go beyond my eyes. If I can't see what I saw at the moment I tripped the shutter, then it gets discarded…Call me fussy - Maybe!" I've been involved in surface and underwater photography for several years, changing from film to digital in 2004. Initially, I completed a Certificate in Photography at Seven Hills College of Art, however, other pursuits lead me elsewhere and I worked for several years in the Ambulance Service, military and in operating a SCUBA diving business. During this time, photography remained a strong interest. In the late 1990's I completed a Bachelor of Science Degree with First Class Honours majoring in paleontology. I also hold a SCUBA Diving Instructor rating (FAUI & PADI) and am qualified to teach advanced first aid. 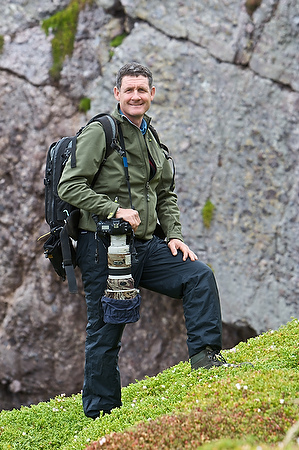 With my formal qualifications in science and photography I have a unique perspective on the environment; I have the ability to see nature, the environment and wildlife through an artistic eye, however, I also have the knowledge to understand the science behind the image. Predominately concentrating on photographing non captive wildlife I strive to document animal behaviour and to produce photographs that convey a sense of meaning and purpose. For me photography of the natural world is more than just pretty settings and cuddly animal photos. It's a concern for the environment and the earth that all living creatures must share. IMAGE: Preparing to photograph Shy Albatross on an isolated island off Tasmania, Australia. I use Canon professional grade cameras and lenses and all digital images are shot in RAW format at an extremely high resolution. In most cases, what you see in the final product is what I saw through the lens. I do very little digital modification during processing. I do not add and subtract objects from the image using computer software. It's important to realize that images viewed on the Internet pale in comparison to an actual photographic print. Subtle details and nuances of colour are impossible to convey in a low-resolution web image. For my underwater work I use Subal underwater housings and Inon strobes. Member of Canon Professional Services (CPS Australia).